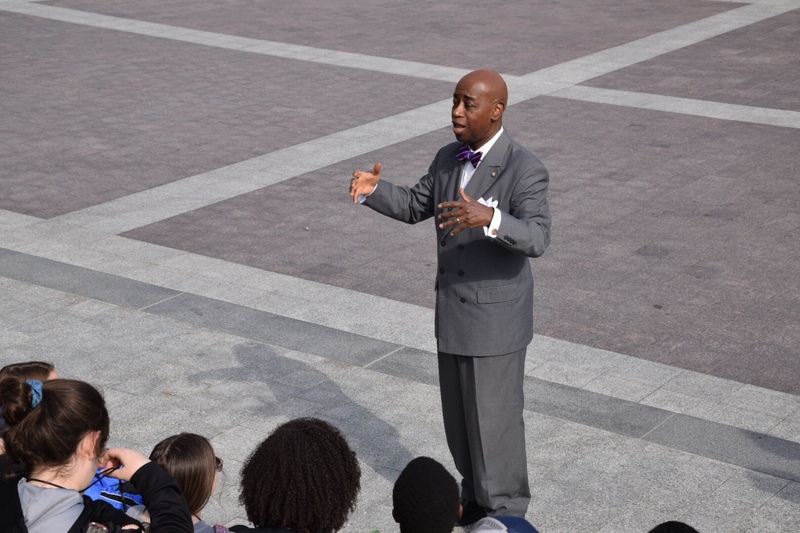 Chaplain Black met with us on the back steps of the Capitol Building. He told us that he was the 62nd Senate Chaplain, and that he had been serving for 16 years, which is the second longest tenure in history. He said that he had attended Christian schools from first grade through seminary. He also told us that he had served in the Navy for 27 years and had doctorates in theology and psychology. He grew up in inner city Baltimore and then received a check of $200,000 for the second of six books he has written. Thomas Nelson paid him before they ever saw the book. When he was 8-years-old, his mother gave him a record of the 57th Senate Chaplain, Peter Marshall, delivering a sermon. 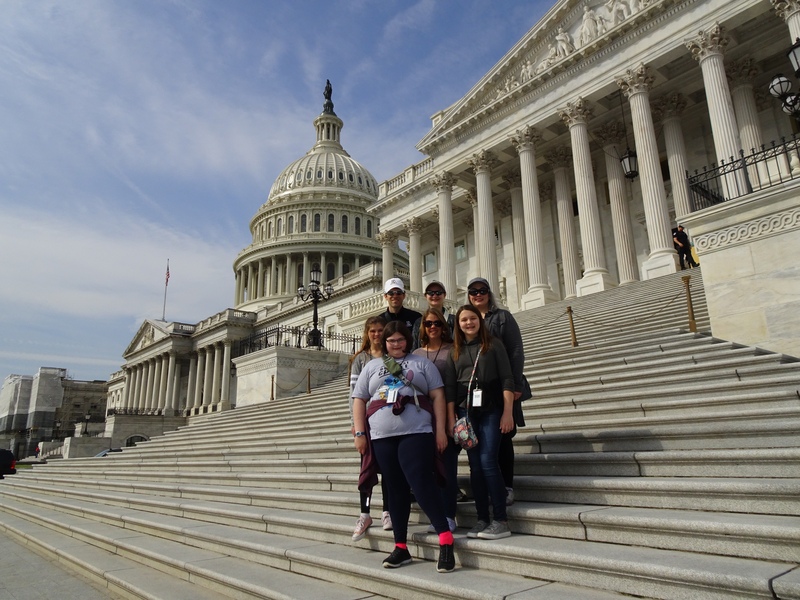 He said that he listened to that over and over again until he had it memorized never contemplating that he would one day also be a Senate Chaplain. He said that he still knows it by heart today. He said that when he was in the 9th grade he was a “D” student, but after learning this verse he started doing everything twice. By the time he got to 10th grade graduation (not a typo) he was Valedictorian. He said that this verse will “stupid-proof” your life. He said that for 50 years he has started each day by praying to God for wisdom. He said that he was convinced that if you continually asked God for wisdom, He would not allow you to do something that was long-term stupid for your life. He said that by following these things, this group could shake the nation and the world. He finished the message by talking about the parable of the talents in Matthew 25. He explained that God is not an equal opportunity distributor of gifts and encouraged the students to use the gifts they have been given. Before he left he took questions. The first was what was his message for the current Congress. He said that he Reminds them about Romans 8:28, and encourages them to major in loving God and minor in everything else. The next question was regarding the process for selecting the Senate Chaplain. He explained that they are nominated by senator and there are eight senators on selection committee. There are three rounds of interviews with the final round conducted by the majority leader. His final interview was with Bill Frist from Tennessee. He said that most senators are part of Christian denominations, and he focuses on what they have in common. He said that almost all can say amen to the apostles creed. He closed out his time with us by leading everyone in a verse of Amazing Grace. Later one of the moms told me how much they enjoyed listening to Kate sing. 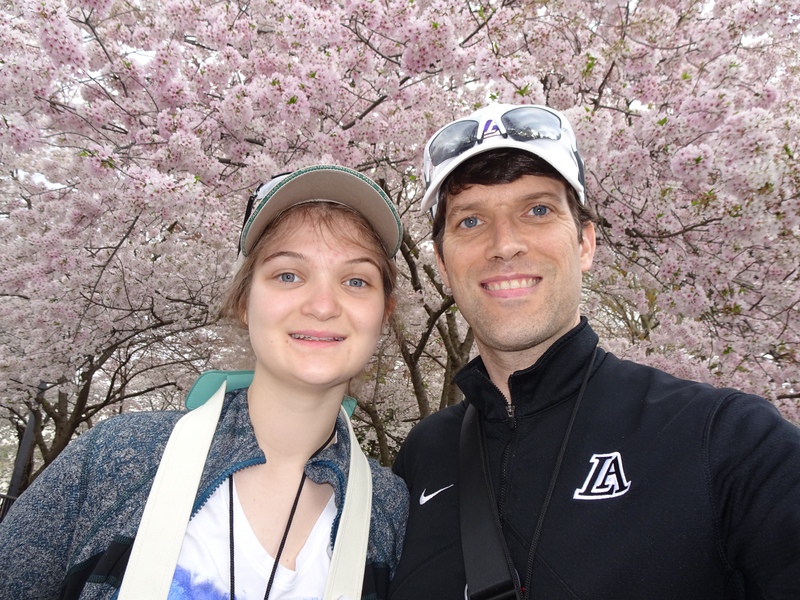 For the next few hours, we had the option to visit any of the Smithsonian Museums we would like. 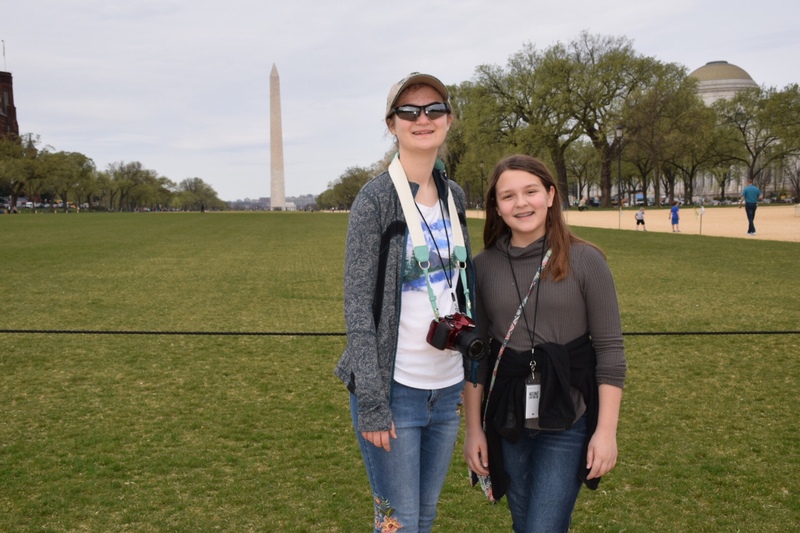 Two of the girls in our group wanted to do Natural History and two wanted to do American History. Since we have thee chaperones in our group we decided to split up. 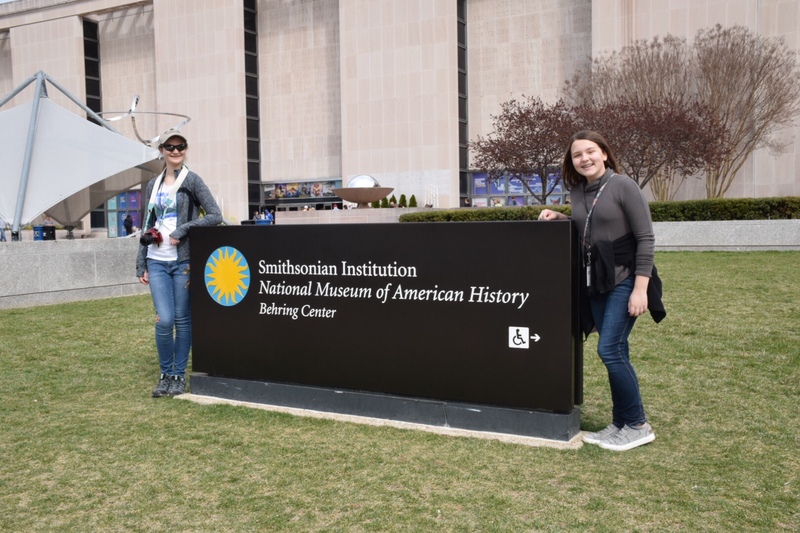 I ended up going with Kate and Ava to the American History Museum, which was one of the same ones I visited as a child. 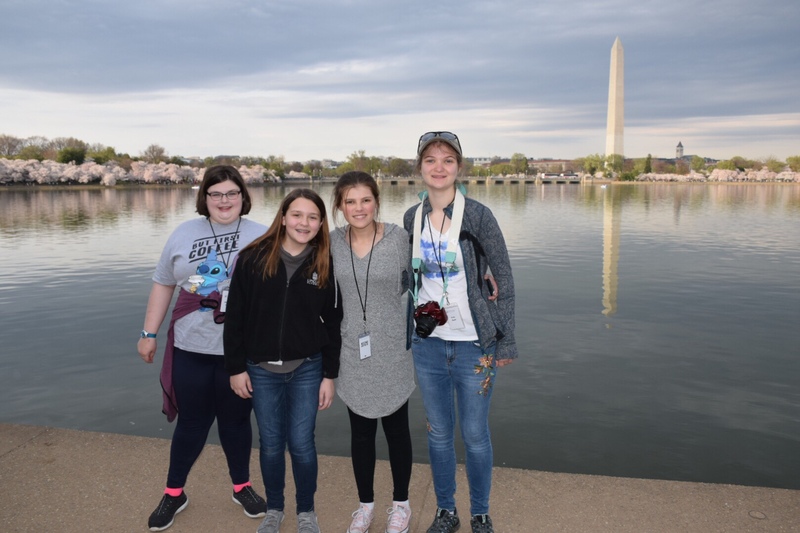 After walking from the Capitol Building through the National Mall to the American History Museum, we first went to see the Star Spangled Banner. This is the flag that Francis Scott Key saw on top of Fort McHenry in Baltimore when he wrote what would become our National Anthem. This occurred on September 15, 1814. Seeing this flag was one of my favorite memories as a kid and it was special to see it now with my daughter Kate. Back then they would only display it a few times a day, but now it is on permanent display under glass in a climate controlled area with very low light. The flag itself has 15 stars and 15 stripes, which was the configuration from 1795 to 1818. Today the flag is 30′ x 34′, but was originally 30′ x 42′ when it was made by Mary Pickersgill in 1813 in Baltimore. Some pieces, including one star, were cut away in 1800s as keepsakes. Each star measures two feet across. This was definitely one of the highlights of the museum and Kate also said that it was her favorite thing there. It gave me chills to see it again. Next we went to see a pair of Dorothy’s Ruby Slippers from the Wizard of Oz in 1939. 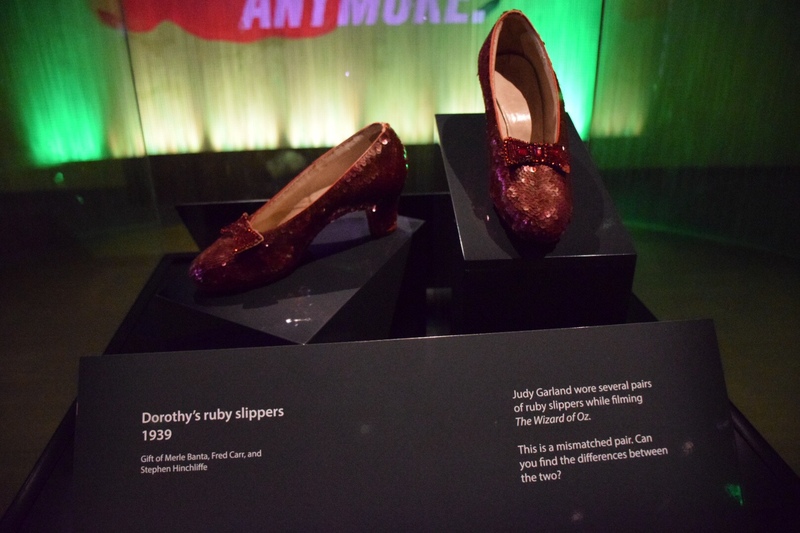 I didn’t realize that I would ever need to know stats about the Ruby Slippers, but I learned that they are size 5, and each one contains 2,400 sequins. They were originally store bought, but felt was added to the bottom to reduce the clatter on the yellow brick road. Seeing these shoes was Ava’s highlight, and it brought back a lot of memories for me watching the movie as a child and the later with my own girls. We then saw a collection of inaugural gowns and china sets from several First Ladies. We learned that no First Lady is required to donate their inaugural gown but it has been a tradition. In the President’s exhibit we saw a number of interesting artifacts such as Bill Clinton’s saxophone and John Quincy Adams’ chess table. 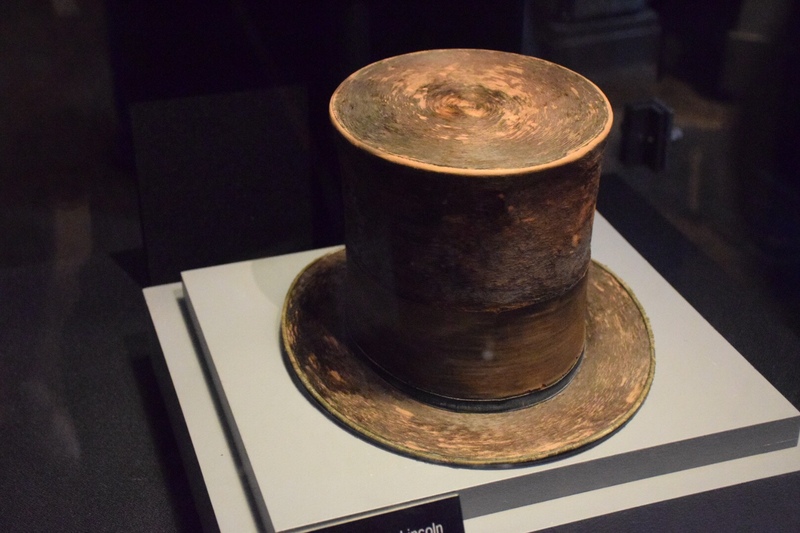 By far my favorite thing in this area was seeing Abraham Lincoln’s top hat from when he was assassinated in Ford’s Theater on Good Friday, April 14, 1865. George Washington’s uniform for portraits and special occasions. The waistcoat and breeches were from 1783 and the regimental coat was from 1789. There was a painting of Washington right beside the uniform where he was wearing the same uniform. Andrew Jackson’s uniform and sword from battle of New Orleans in War of 1812. 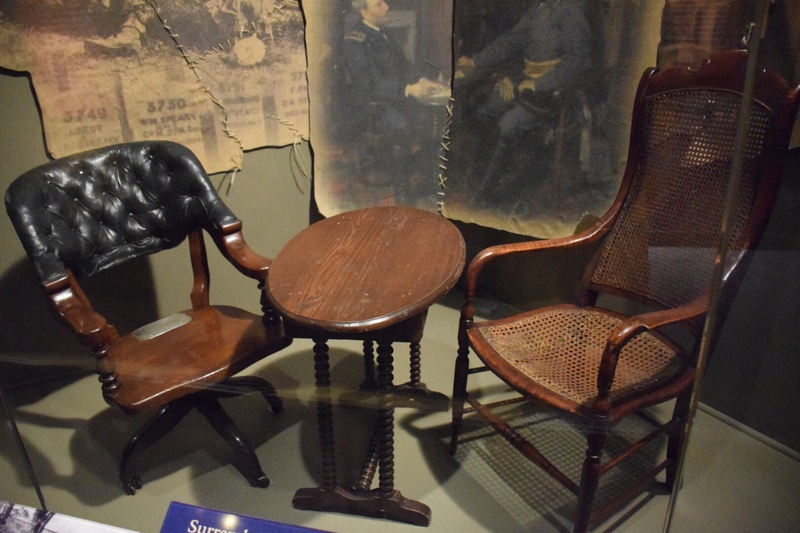 The table and two chairs from Appomattox where Lee and Grant negotiated the Confederacy’s surrender on April 9, 1865. Finally we went to the basement where we saw Michael Keaton’s Batmobile from Tim Burton’s 1989 Batman movie. We also saw several other superhero item like George Reeves’ Superman costume from the 1950s tv show. 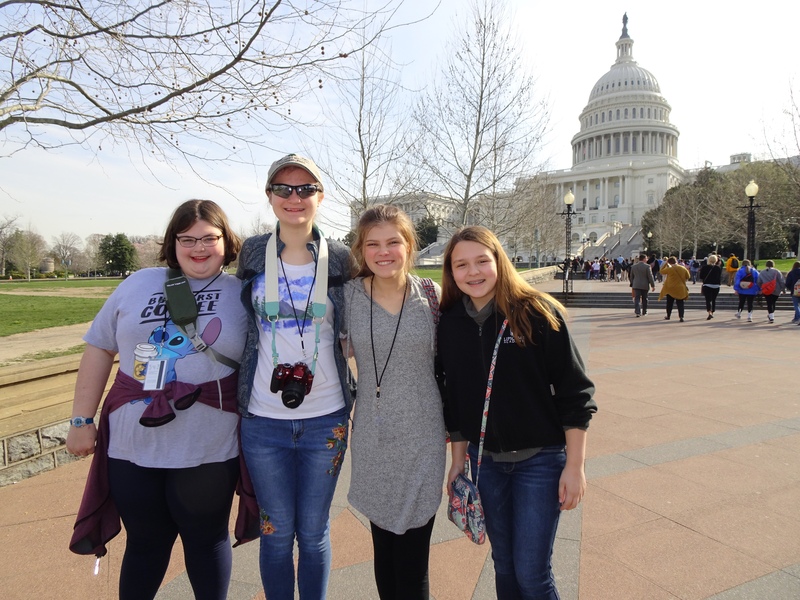 After grabbing lunch at the Museum, we met the rest of our larger group at the National Museum of African American History, which is the newest Smithsonian museum. 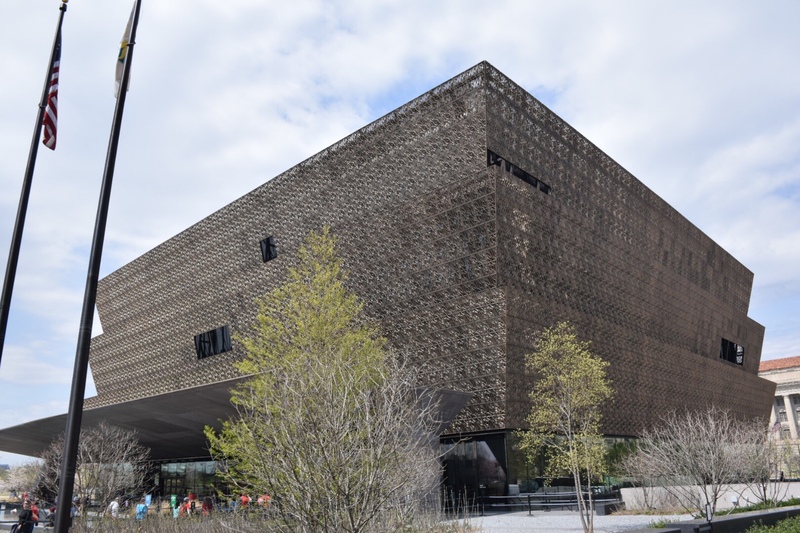 We started at the top and went through the cultural exhibit which focused on African Americans in theater, music, and art. After that, Kate and I headed down to the bottom floors that contain the history sections. They cover three floors and 1.5 miles. They focus on slavery, segregation, and a changing America starting in the 1400s and going through today. Similar to the Holocaust Museum yesterday, there was a lot to process. Kate came up to me early in the slavery exhibit telling me of a story she had read that had impacted her. It was about a woman on a slave ship that the captain threatened to flog because the song she sang was so sorrowful and it was too much for him to bear. There were two main things that stood out to me in the history section. The first was the huge number of slaves that were brought by various European countries to the Americas. I don’t ever remember studying about these numbers in school, but it was well into the 10s of millions. Portugal brought 5.8 million slaves. This is beyond comprehension. The second thing was the Emmett Till Memorial where they had his original casket that was displayed publicly in Chicago after his murder in August 1955. While this was hardly an isolated event, it was a major spark that help start the Civil Rights movement. Next we got back on the bus and visited the Franklin Roosevelt and Martin Luther King Jr. Memorials. The Roosevelt Memorial is divided into four sections to represent his four terms in office. 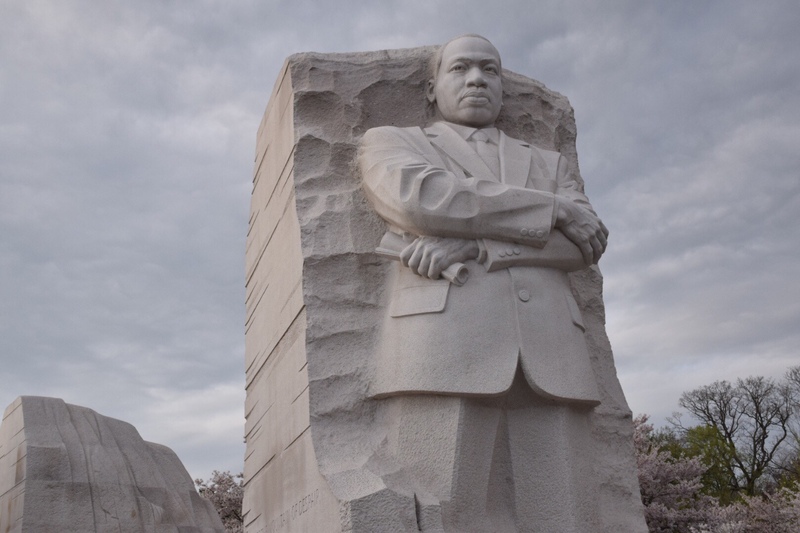 The MLK Memorial has an entrance that represents the Mountains of Despair that Dr. King talked about with his statue beyond as the Stone of Hope that comes out of those mountains. 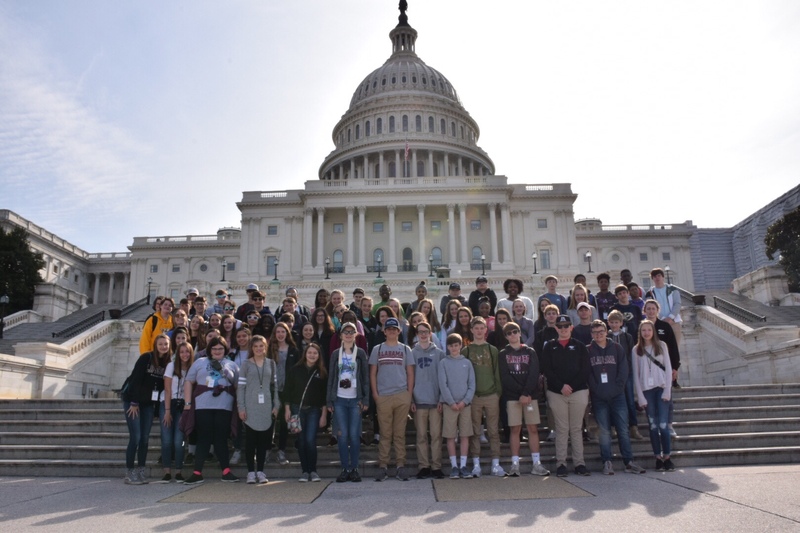 At the memorial, the students were reminded by Franklin Bennett that today is the 51st anniversary of his assassination. Then several parents shared their thoughts on Dr. King and his impact on their lives and our world. 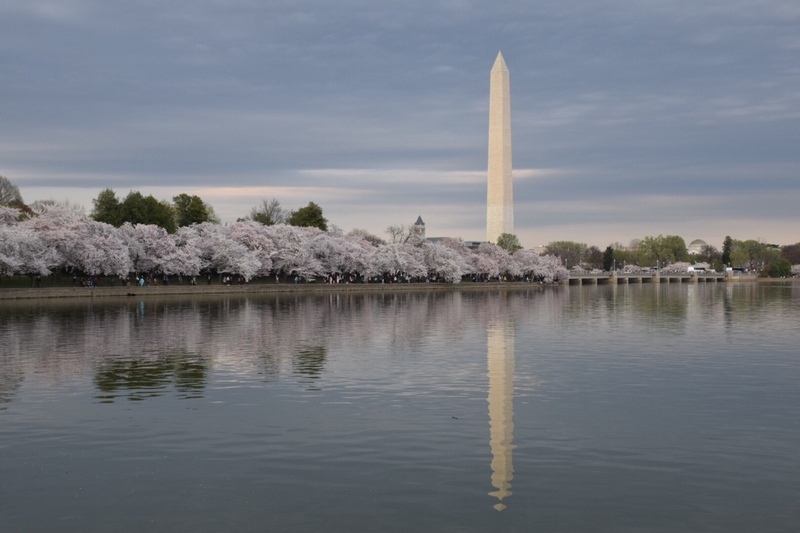 Around both of these memorials, the cherry blossoms were just stunning. We then had a nice dinner at Vie de France, and I enjoyed some thought provoking with some of the other parents about the impact of the day. As I write this now we are back at the 4-H Center and have unfortunately just watched the Lipscomb Bisons lose to Texas in the NIT finals. I’m hoping to get to bed earlier tonight because we have another packed day tomorrow before heading back home tomorrow night.